Avoid One Of The Biggest Facebook Ad Mistakes! When finding your niche on Facebook via the audience selection process, make sure that you don’t LUMP all your criteria for finding your niche market (using Facebook’s interests, demographics or behaviors) together. Unrelated interests, demographics or behaviors should be properly separated out and used to further narrow down your Facebook ad audience to distinctly match your unique niche market! When you create an ad audience, Facebook first gives you demographic choices to start the audience selection process. They then provide an area for you to enter interests, demographics or behaviors called, “INCLUDE People who match at least ONE of the following.” Please see the image below. After you have entered in all interests, demographics or behaviors that are SIMILAR ways to identify one particular aspect of your niche audience, then click on the Narrow Audience link below the box to open up another audience input field that is called, “and MUST ALSO match at least ONE of the following.” Put your second set of SIMILAR audience criteria in here before moving on to the next SIMILAR set of audience criteria until you have the audience that you want. SIMILAR AUDIENCE EXAMPLE: In the image below, we show a niche audience of Christian Home School Moms. The first section is all about SIMILAR interests, demographics or behaviors that relate to Christianity. You wouldn’t want to include in the same detailed targeting area interests, demographics or behaviors that also related to Homeschool Moms. We have properly separated out the Christian and Homeschool Mom aspects of this niche into separate detailed targeting areas! WHY NOT LUMP ALL AUDIENCE CRITERIA TOGETHER? If you lump unrelated aspects of your niche into one detailed targeting area, Facebook can show your ad to any of those interests, demographics or behaviors “OR” another. Which means you just gave control of your audience over to Facebook for exactly who will see your ads. 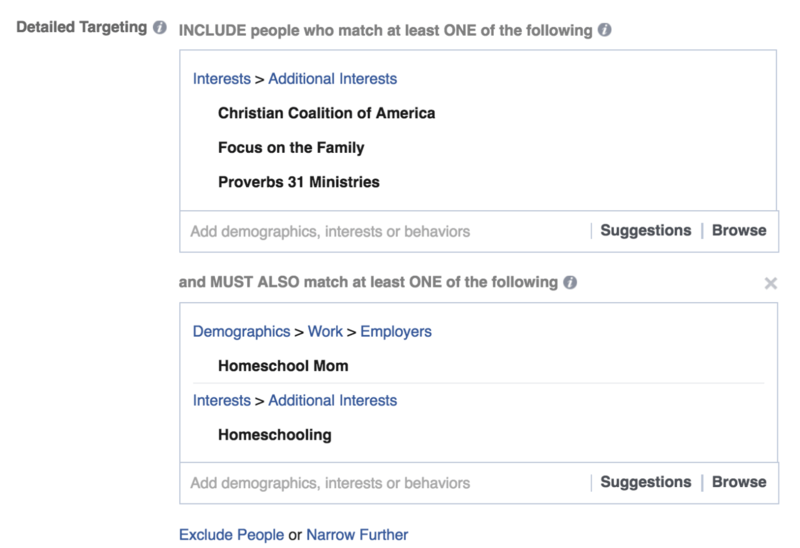 Facebook may find it easier to show your ad 95% of the time, to say, any of the Christian related interests, demographics or behaviors and exclude the Homeschool Mom related interests, demographics or behaviors almost entirely…if they are all in the same detailed targeting area. This seems like a small point to be made, but potentially huge ramifications for your niche validation process and ultimately the success of your ads. Start by deciding on your niche audience priorities. First, pick a demographic base and then fill in the “INCLUDE People who match at least ONE of the following” area with all SIMILAR interests, demographics or behaviors. Now click on the Narrow Audience link and fill in your first “and MUST ALSO match at least ONE of the following” sections that uses additional interests, demographics or behaviors that are all similar to each other, but unique to what you put in any other section. Then move on to the next audience identification priority within an whole new “and MUST ALSO match at least ONE of the following” section until you hit no less than 250,000 in reach (our recommended minimum for a Facebook audience size. FOR A DETAILED VIDEO EXAMPLE OF HOW TO PROPERLY PUT A FACEBOOK AD AUDIENCE TOGETHER, please see the 1:06:10 mark of our Facebook Ads webinar. Here’s to your Facebook ad success!